Hello, Debbiedoo’ers! I’m Amy, aka Ms. Toody Goo Shoes. Before we head through the front door, I must say a BIG thank you to Debbie. She has been extremely helpful to me in my short blogging career. …we hold some kind of world’s record for shopping malls! I ask you, is that not reason enough to live here??? Mr. Goo Shoes and I, our 14-year old son Junior Goo Shoes, and Sadie, the dog, are about to celebrate our 11th year in this house. We moved to NJ just as Junior GS turned three years old. Coming from an apartment building in New York City, the kid could hail a taxi, but stairs? He had no idea what they were. No joke. And he thought the living room was the lobby. Our home is a side-hall colonial, and it’s 39 years old…same age as me, LOL 😉 It kind of ‘demands’ traditional decor on the interior. The location is great — just a 40-minute drive to NYC, and 90 minutes “down the shore.” Yes, we really do “tawk” like that! When we first moved here, the front door was forest green. 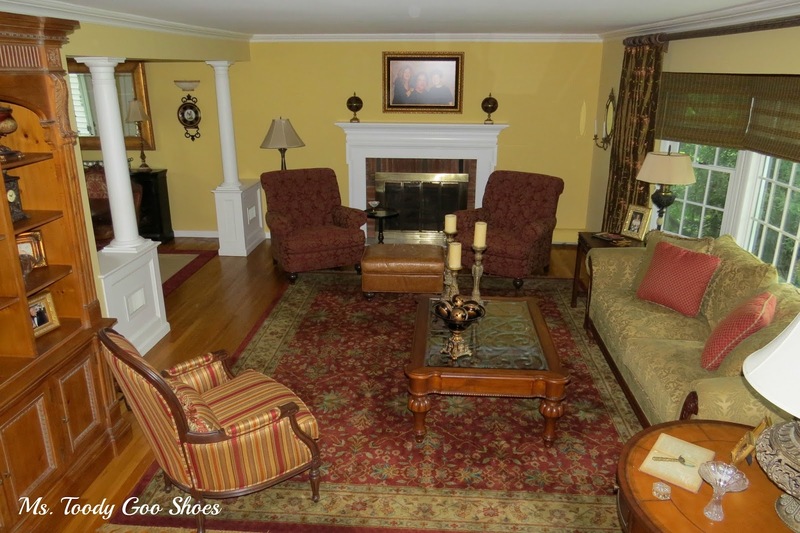 It made the house look sleepy, so we painted it Benjamin Moore Heritage Red to wake it up. By the way, the entrance hall rarely looks like this in real life. Junior Goo Shoes’ things — sneakers, backpack, basketball, dirty socks, etc. — are usually strewn all over the floor. For the life of me, I cannot get him to put his stuff in the mudroom. when I turn on the blender while he’s watching TV, heh heh. Can you spot Sadie under the chair? 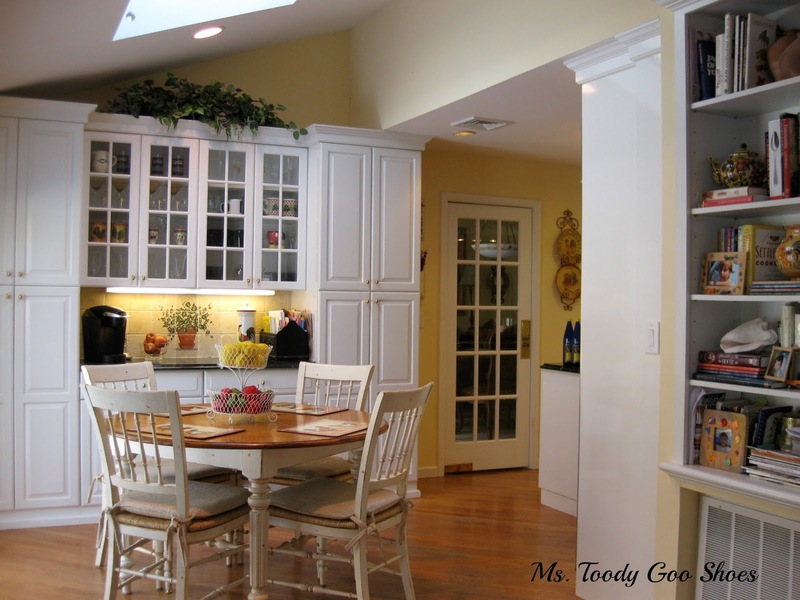 The Kitchen is just off the Family Room. 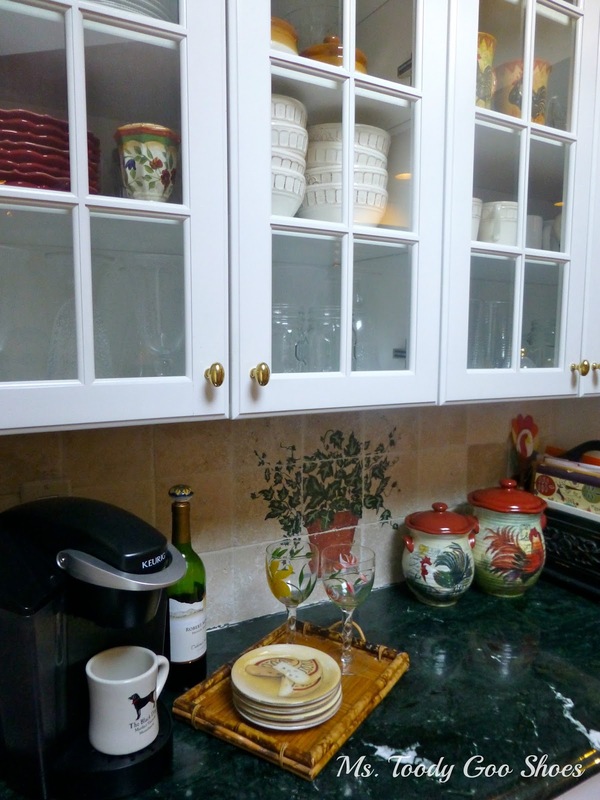 A huge plus when buying the house was that the kitchen didn’t need to be renovated. 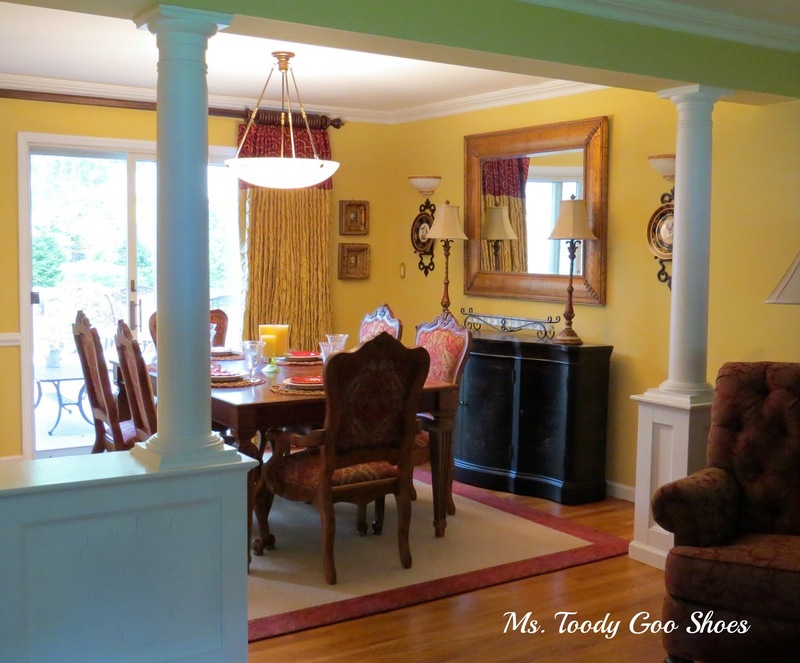 I love the white cabinetry, green granite countertops and the columns. We did refinish the wood floors, and put in the tumbled marble backsplash. We also put in the stainless steel dishwasher and refrigerator. We plan to replace the oven and stove someday. 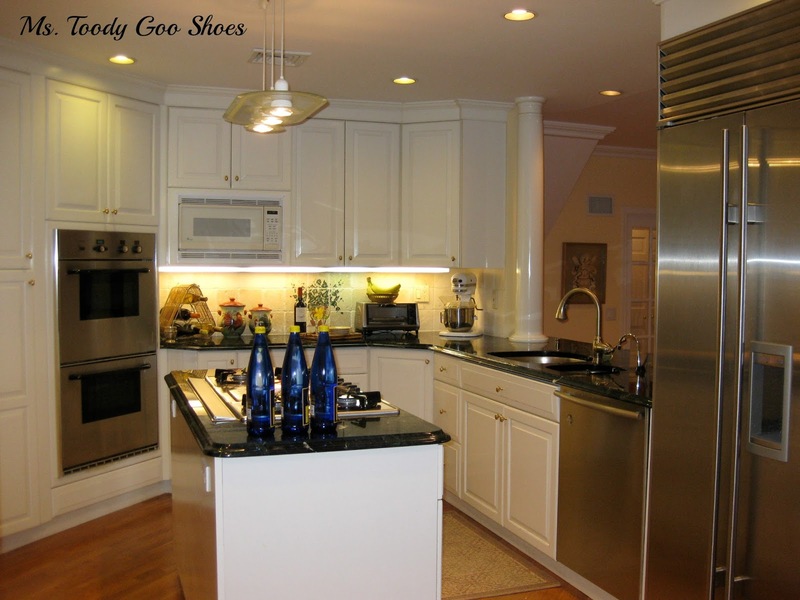 We’ve been talking about replacing the light fixture over the stove for years. Why does it take so long to do certain things? 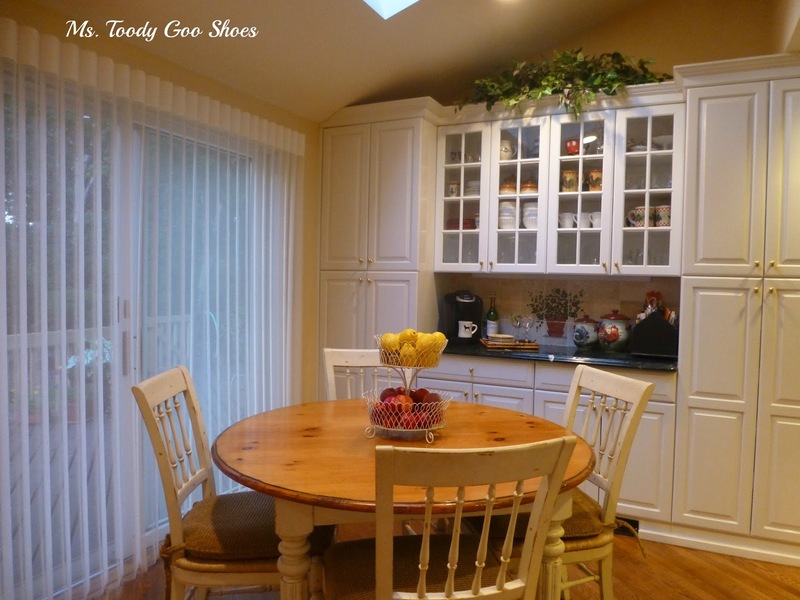 Almost everything in the glass cabinets is from Home Goods. I think I have a dish fetish. Is there a 10-step program for that? 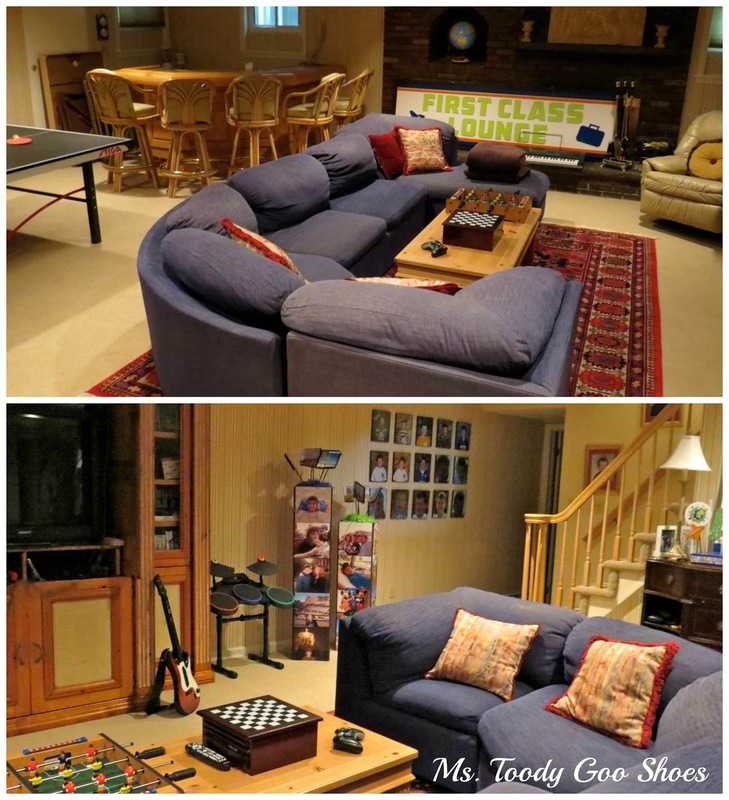 The main floor has a great flow, which is nice for entertaining. The Dining Room is off the kitchen. If I’ve got one complaint, it’s that the Dining Room is too small. People who sit on the buffet side of the table get trapped in there. The Living Room doesn’t get much use. Sometimes, when we have a big snowstorm, we’ll light the fireplace, and hang out in there. Occassionally, I’ll sit in one of those big red chairs and read. I’m still searching for more pictures to put on the fireplace wall. It looks a little bare. Mostly, the Living Room is just a place we pass by as we run up and down the stairs. I like mixing “trash” and treasures. The crystal dish is an antique that was a wedding gift; and it the little statue is from Home Goods, which cost about $10. 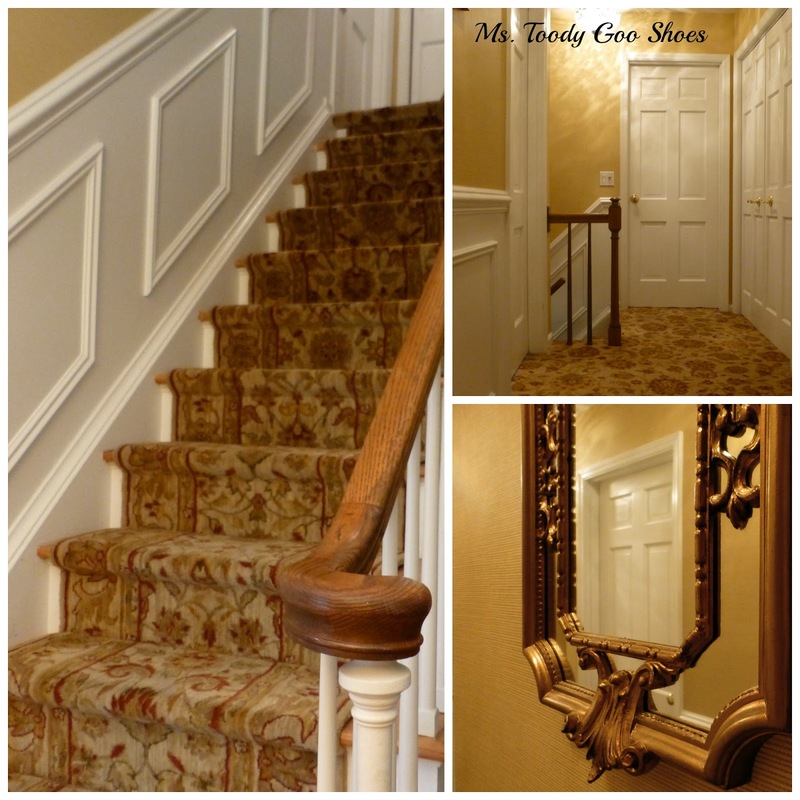 I’m really happy with the transformation of the Hallway. Take a look at what it used to look like, and you’ll understand why. The mirror on the bottom right was a great find at TJ Maxx. When we bought the house, the upstairs was a total disaster. We completely gutted every room. The room layout is awkward. There’s not a lot of furniture in this room, because we have a huge walk-in closet with lots of drawers. I won’t show you that today…some things are best kept behind closed doors! The window behind the bed is small. I used drapes the same size as the double window, to give the illusion that it is a large window. 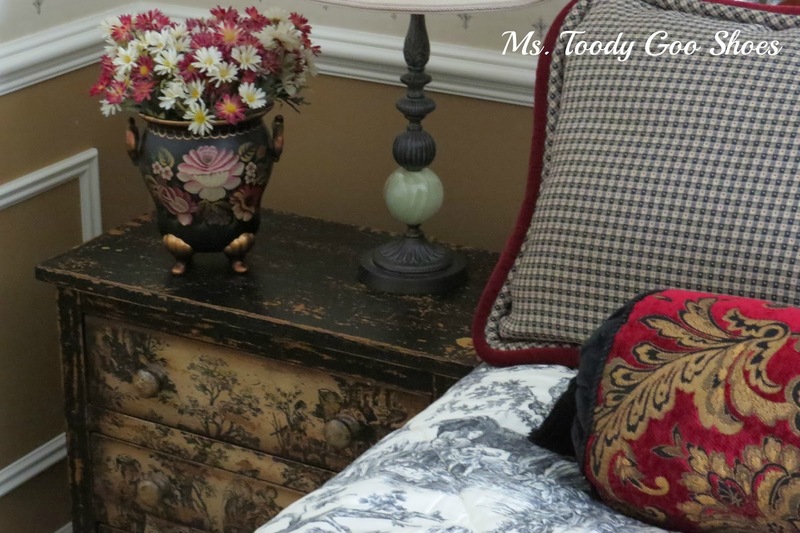 One of my most favorite pieces in the entire house is the distressed toile night table. I’d like it better if it were on my side of the bed! The french doors to the den were not here when we moved in. For that matter, neither was the den. Take a look at these “before and after” pics to appreciate what a dump this space once was! 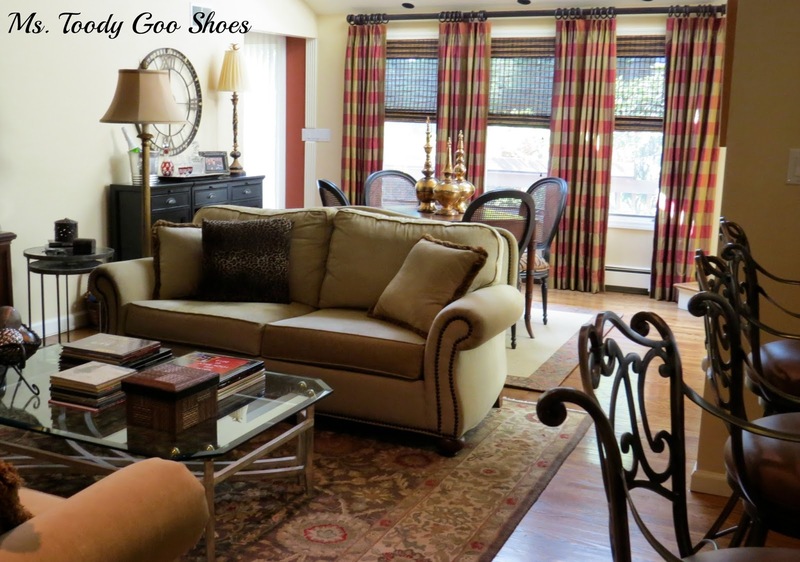 I had to talk Mr. Goo Shoes into the leopard ottoman, another of my favorite things. It’s good and bad that he wants to be involved in the decorating process, you know what I mean? The African picture is made almost completely out of beads. 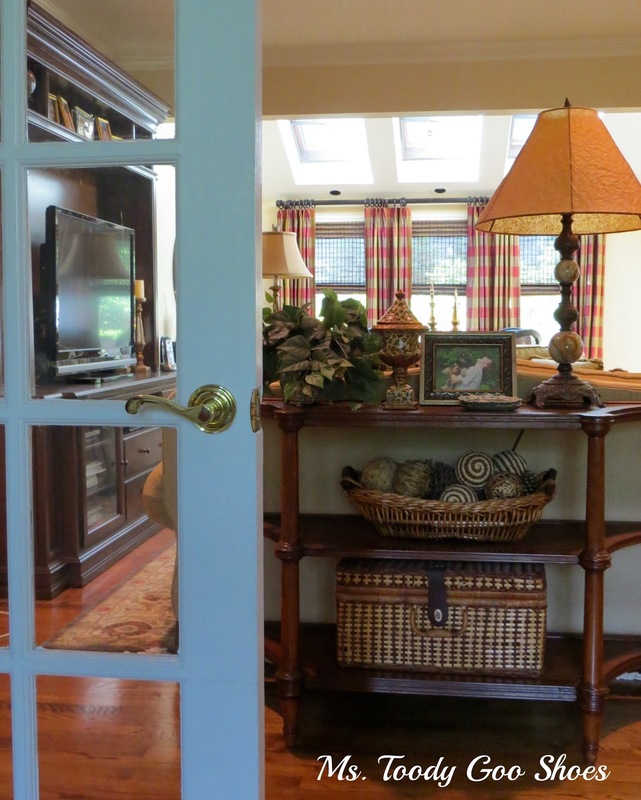 It’s a great burst of color in an otherwise neutral room. 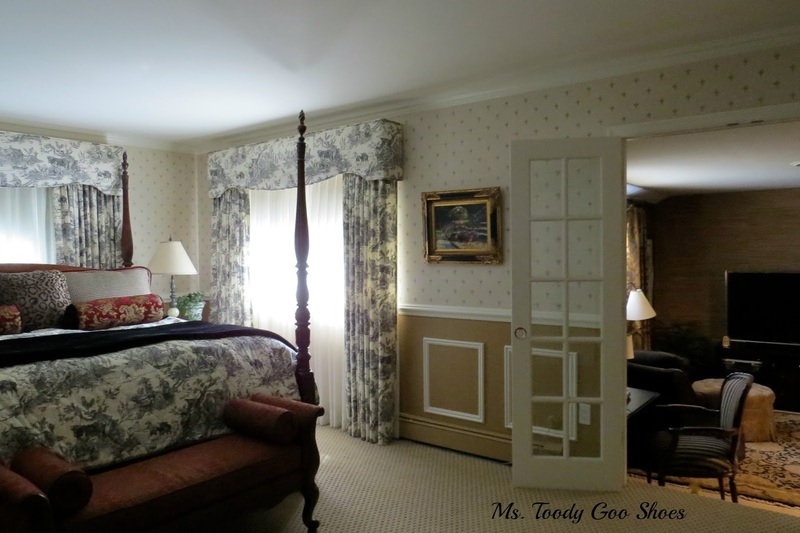 I love this little retreat off the master bedroom. 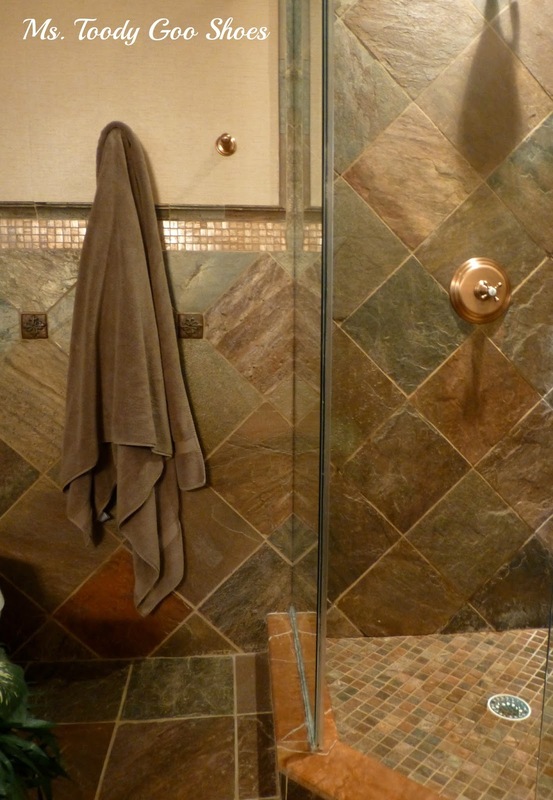 The master bathroom was so disgusting that we used it for storage until we renovated it. It was teeny, so we combined it with a walk-in closet to create more space. The tub had to be hoisted through the window space — scary to watch! And, by the way, the only one who uses the tub is the dog! We are planning to replace the pedestal sinks with a vanity sometime soon. The walls and floors are copper slate. The border is made from glass copper-colored tiles. 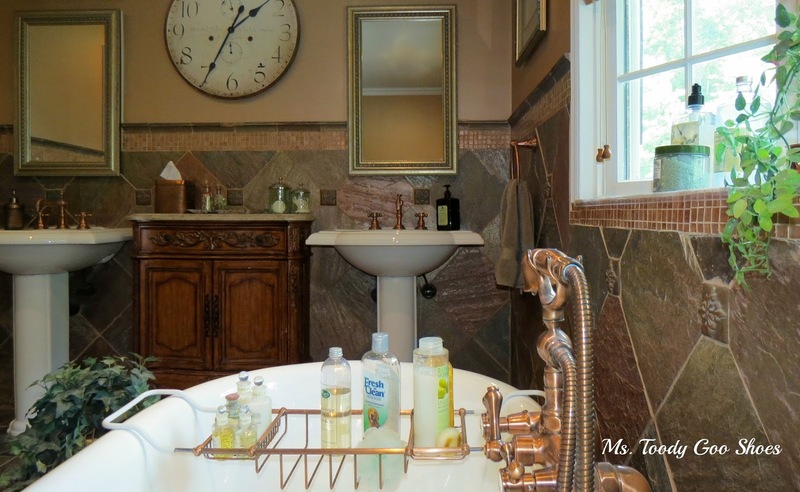 Have I mentioned that this house has four full baths and one half-bath? No waiting in line, here, folks! Great, right? Not so much when you have to clean them. 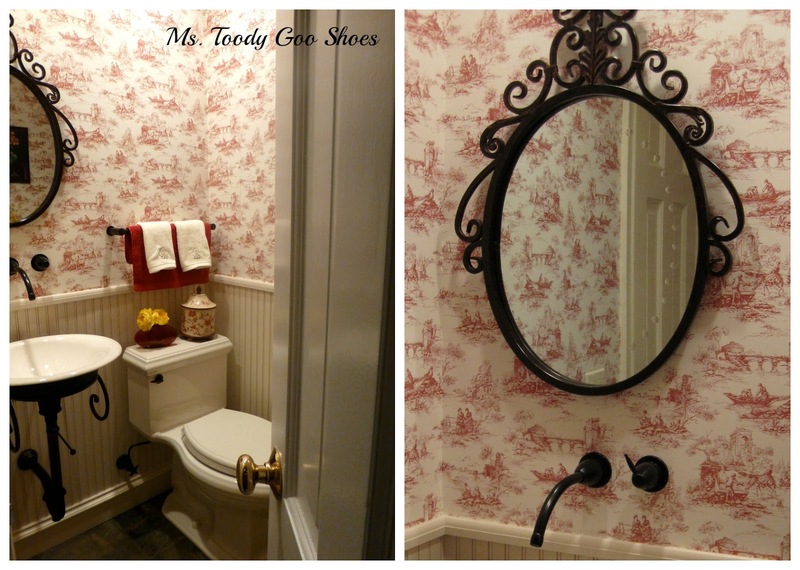 We’ve gutted four of the five bathrooms, and my favorite is this little toile powder room. 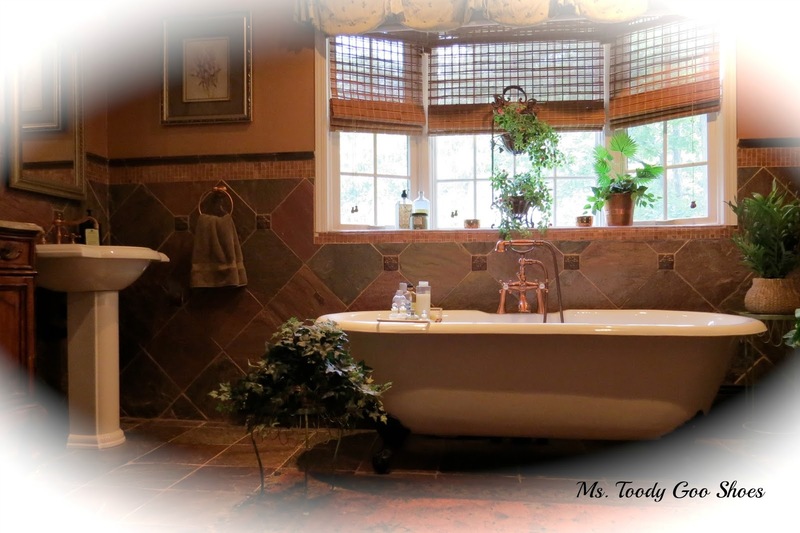 I do love this bathroom, too. 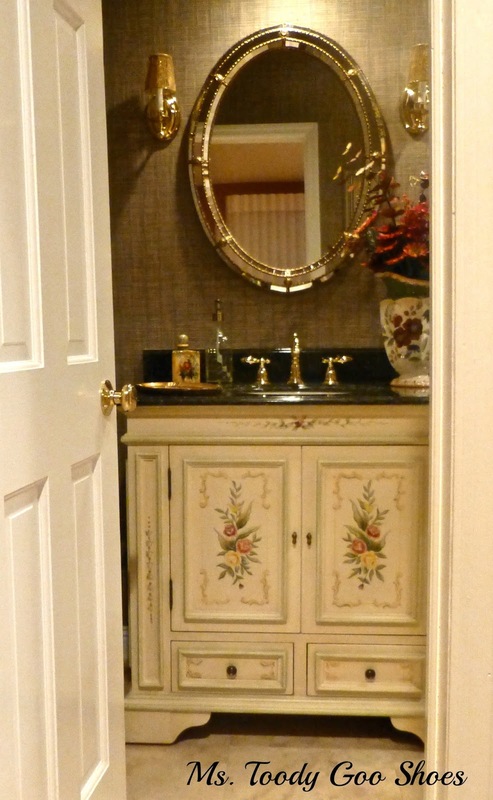 The vanity was purchased at Home Depot Expo, which has since closed. I really miss that store. but it’s hard to see in these photos. The basement is Junior Goo Shoes’ Boy Cave. Trust me, it never looks this neat. I had to take these photos before he came home from camp and messed it all up. I love that I can’t see the mess from upstairs, but I can hear what’s going on! Don’t tell JGS — he doesn’t know that! The Mud Room was another disaster space when we bought the house. You can get the dirt on the mud room in these “before and after” photos. It’s not heated, so I call it my second refrigerator in the winter! The Deck is my “happy place. I did a lot to update it this spring, and I’m so pleased with how it turned out. You can see more photos here. I’m hoping to be able to enjoy it through October, barring another Superstorm. 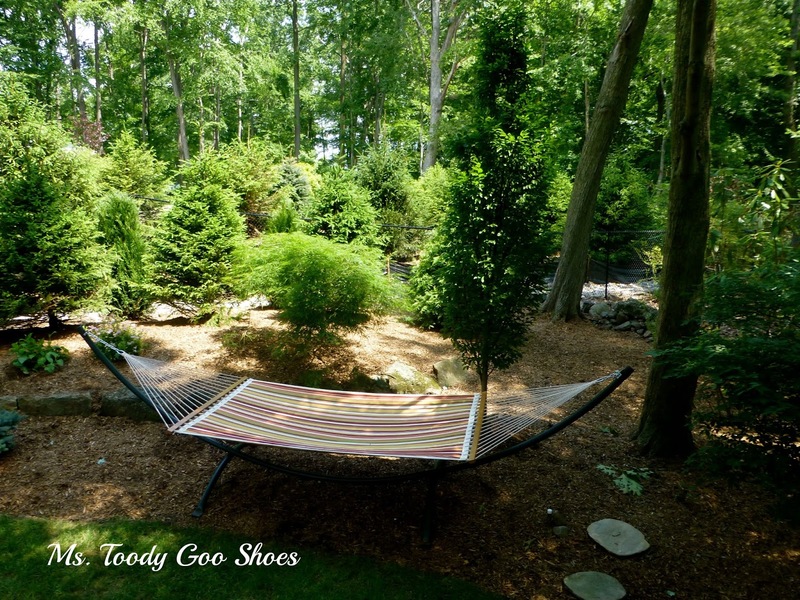 in that hammock this summer. There’s a little space behind the hammock and bushes for a secret garden, which will be next spring’s project. I hope you enjoyed the tour! 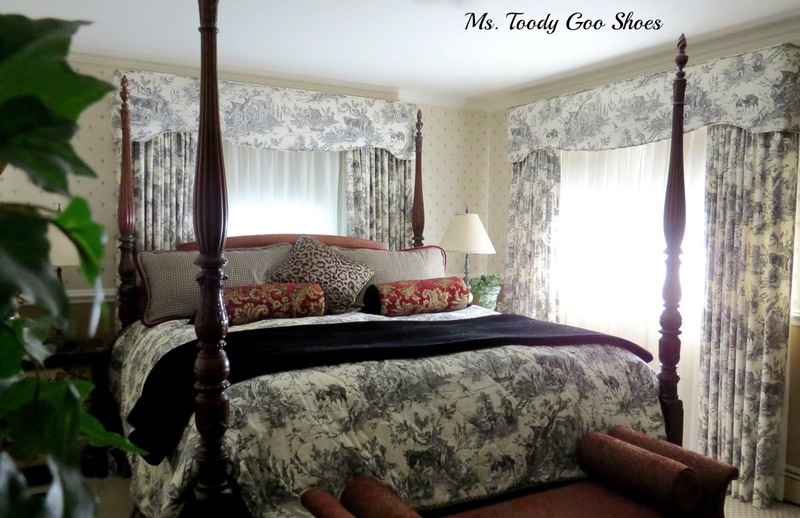 I’ll be doing a series of “before and afters” of some rooms I didn’t show you, so please stop by Ms. Toody Goo Shoes, and have a look!Thanks for coming! What a stunning home. Beautiful details everywhere. 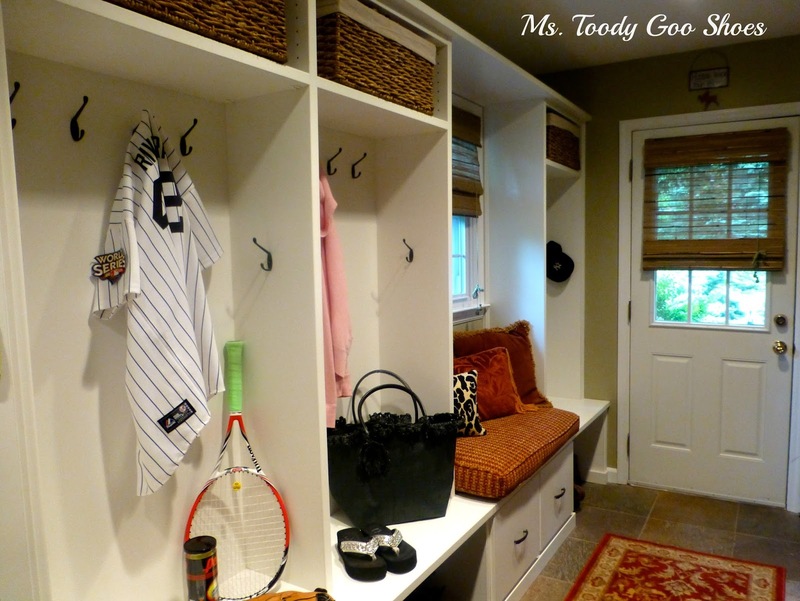 I am in love with the organization in the mudroom. 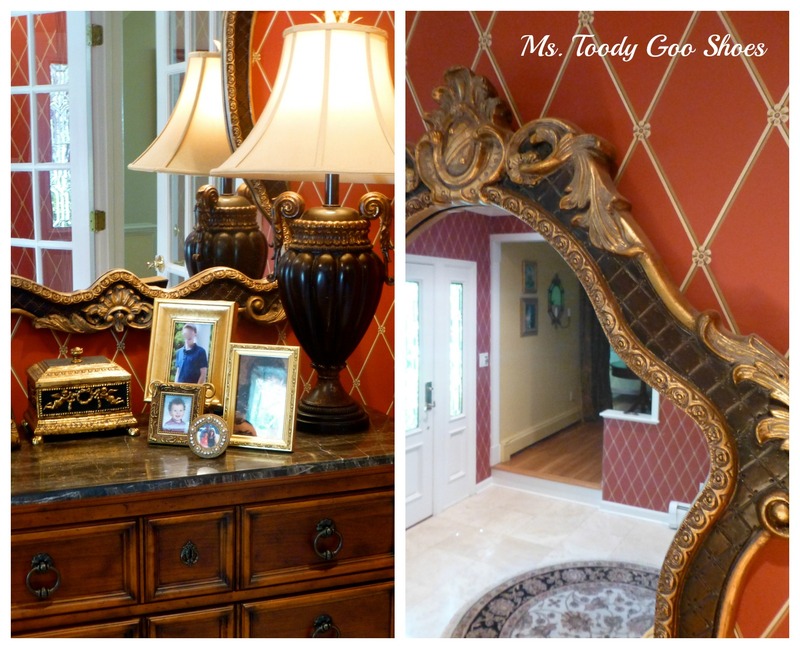 Thanks for sharing Amy’s gorgeous home! Beautiful home! I am from NJ too! Your home looks just like my Mother’s. I wonder if we are closely located?? What a lovely home! All of my favorite colors and toile to boot! I am heading over to sign up to follow Amy. I love her taste. Debbie, Amy’s house is beautiful. (Amy, your house is beautiful.) And huge! I love seeing how creative everyone else is with their home. Thanks for sharing! Great tour, Debbie! 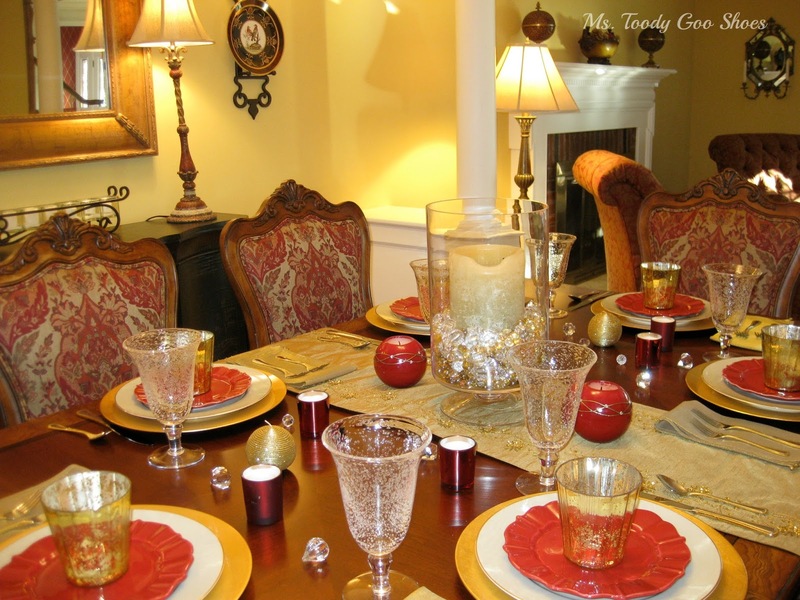 What a beautiful home…I love all of the rich, warm colors. Thanks so much for sharing! 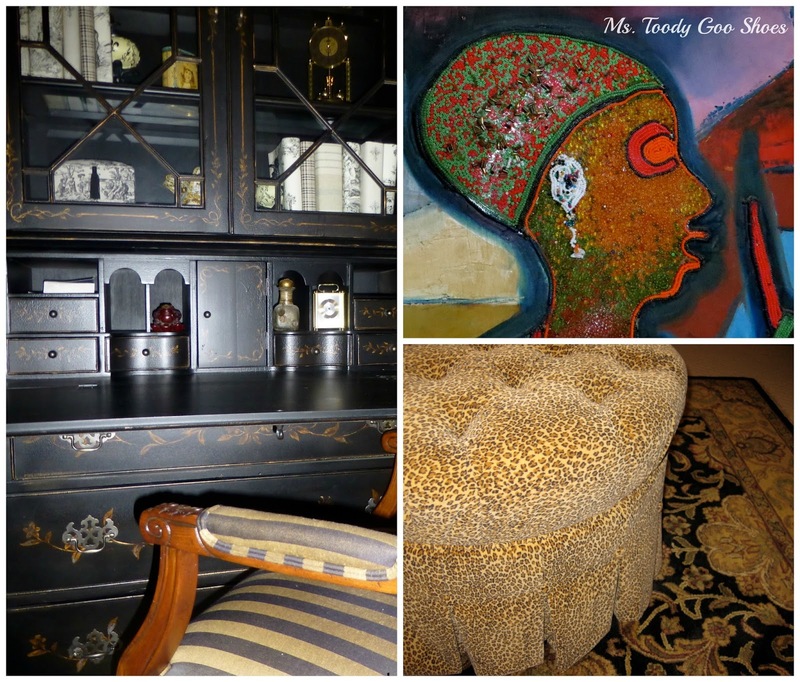 Beautiful home and if I am not mistaken I recognize the room with the leopard ottoman in it from Rate My Space. Did not know that this blog was the same person that I followed on RMS. Small world. You are not mistaken, Kim! My RMS phase was definitely a precursor to blogging! I haven’t looked at that site in a long, long, time. I actually think I remember you, now! Wait a minute you were on RMS…so was I. I totally don’t remember you, but glad Kim did! So funny. I will have to log on (if I remember the password!) and see if I find you and Kim on my page! Boy Debbie, I am so happy and excited to see this home. My colors for sure and it is great to see another Jersey girl!!! 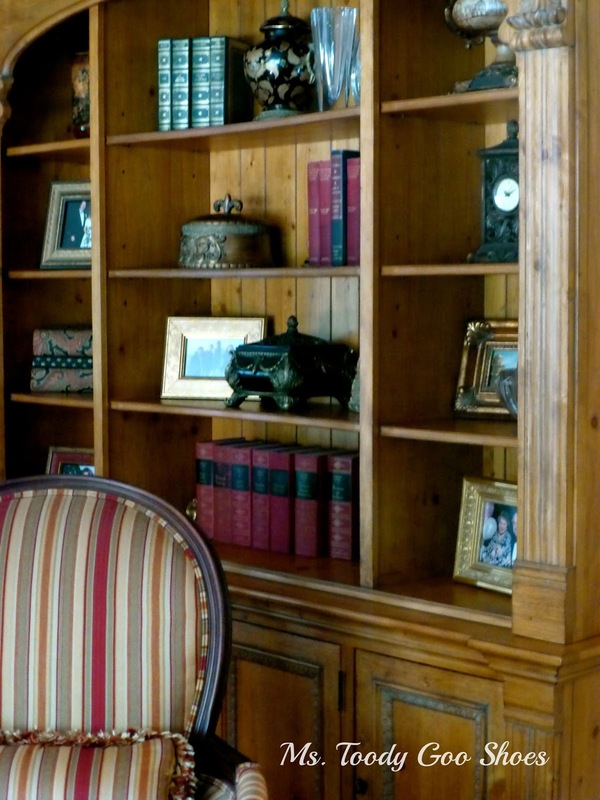 This home is so very warm and inviting and I just adore the style. There was major transformations that took place here. I am going to become a follower of this blog. I never heard of it before so thanks for introducing it to me. Have a great weekend!! 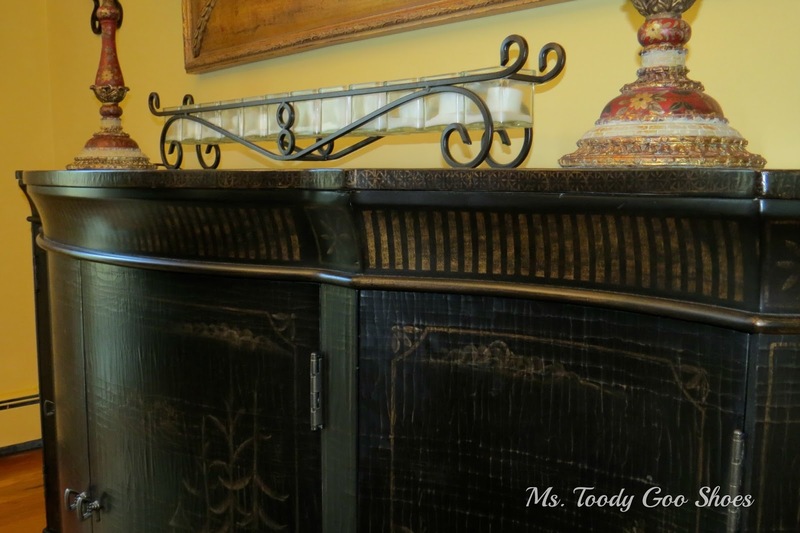 I follow Amy’s blog already and just loved seeing her home tour today! It’s quite beautiful! 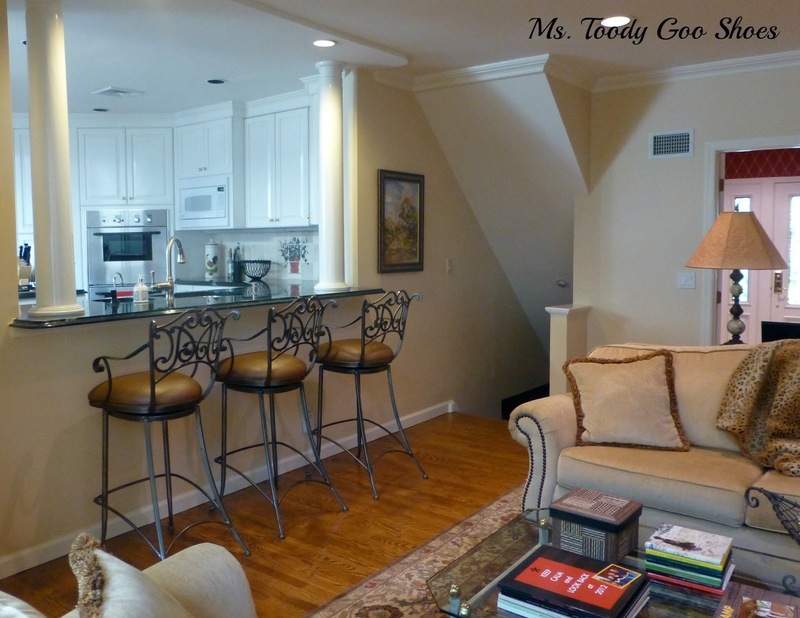 I love how spacious it is and how tastefully it’s decorated. I’m in love with her tub (that she never uses). LOL! Love her back deck area. Wish I had something that nice. Our back deck s#%^$! 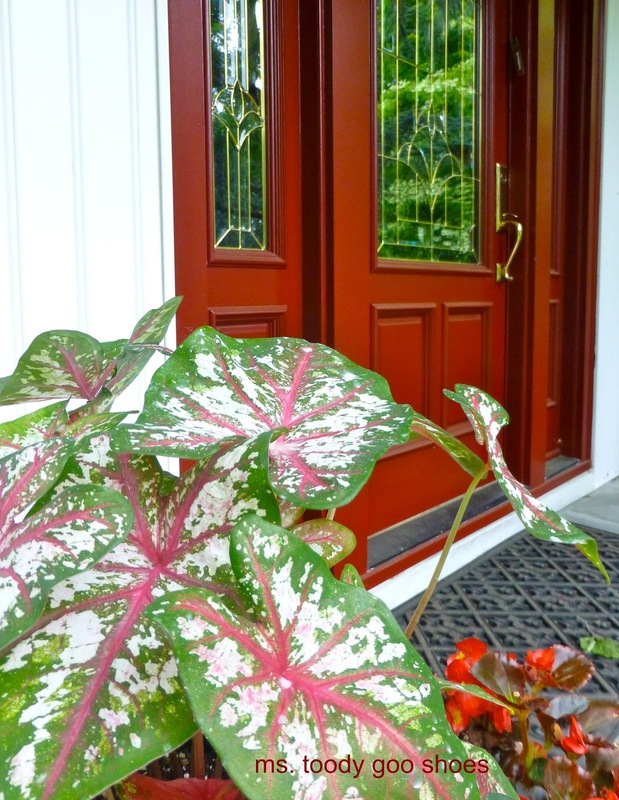 I like the red color on her front door. I can see why she decided to give it some color since it’s so shaded with trees. 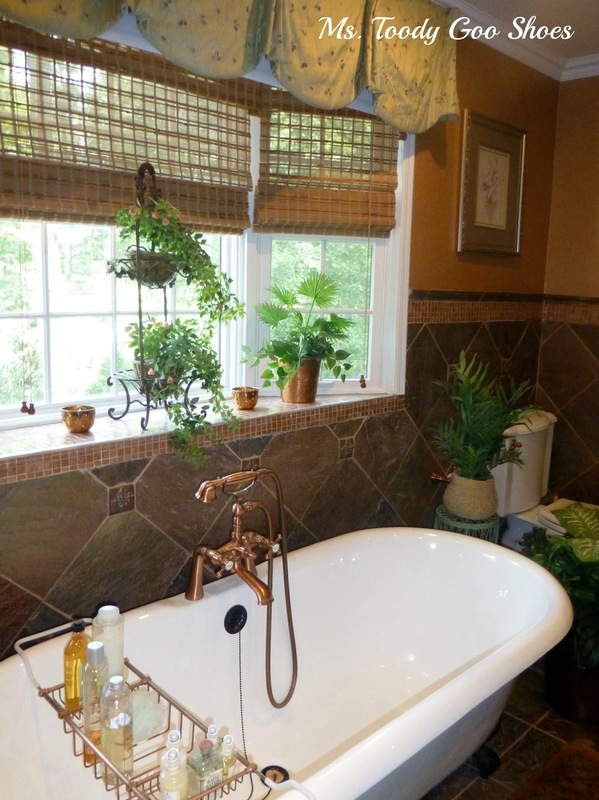 I wouldn’t know what to do with 4 1/2 baths! Great house! 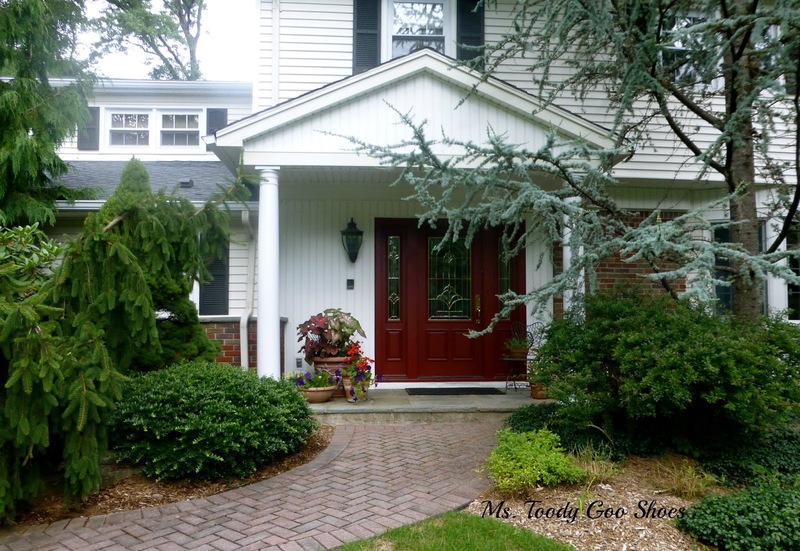 Beautiful home,love the reds and the red door! love the back deck..and I did spot Sadie!! !Lovely tour. 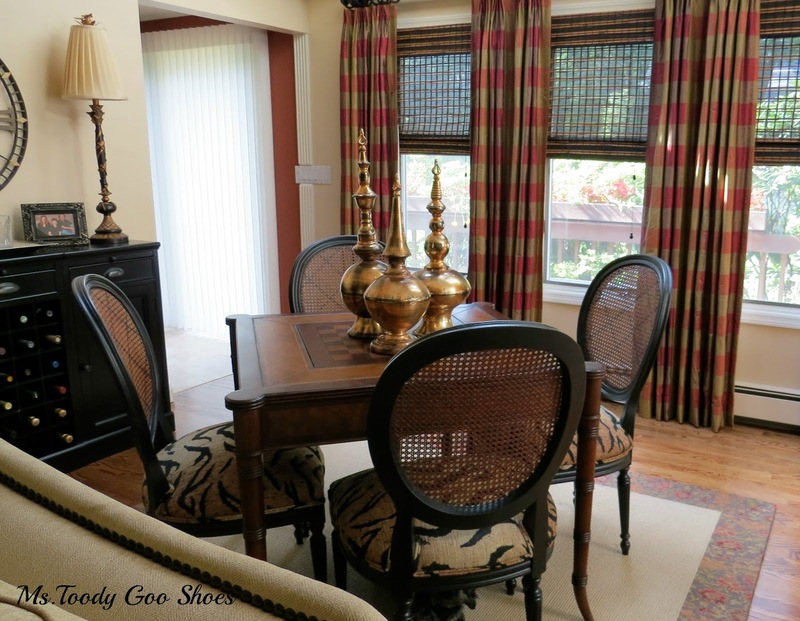 Since you need a bigger dining room….why not use the underutilized Living Room for dining?! Seems like a good spot! Thank you, everyone, for the lovely comments! Truly makin’ my day 🙂 And thank you, again, Debbie, for this opportunity! I loved this tour and want to repeat it soon. 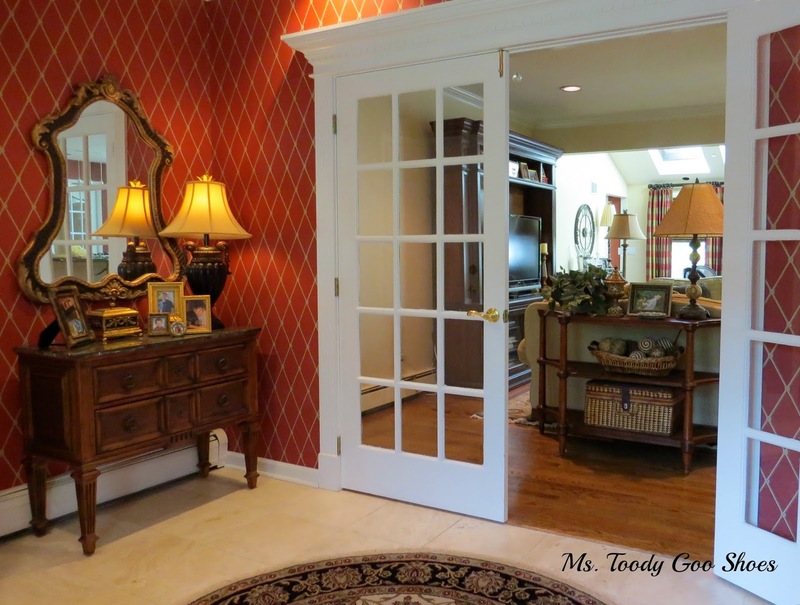 It is so much fun to see so many rooms and beautiful colors in them. This has led me here to debbiedoos too so I’m bookmarking that to visit again. This house is as gorgeous as it looks in the photographs! I have had the honor of seeing it first hand. The warm comfortable feeling is the same feeling you get when you meet the “Goo -shoe” family, a great bunch of people, just honest to goodness lovely people! It should be in Home Beautiful, too. 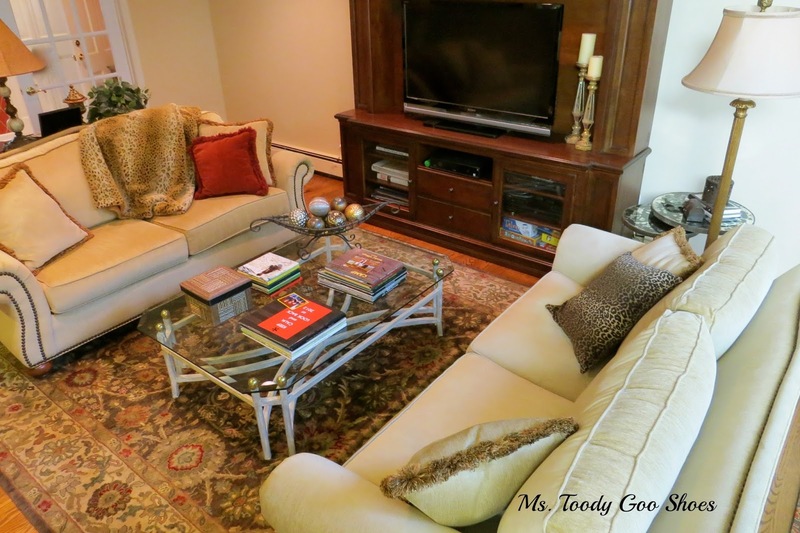 Amy, you can be a home stager as well as a blogger! 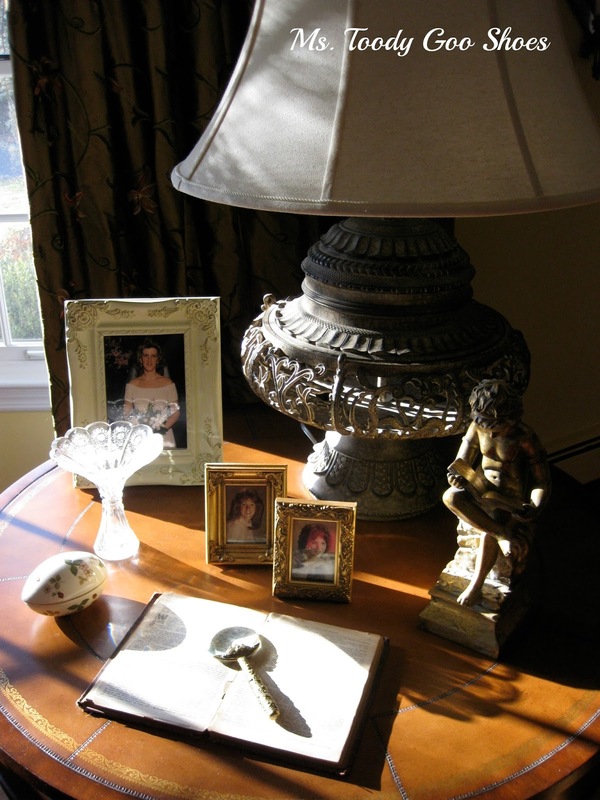 Great pictures and I ditto Barbara’s sentiments about the people who reside in that lovely home. Debbie, thanks for introducing us to Amy. I love her entrance with that red front door. Beautiful home, with lots of special touches. 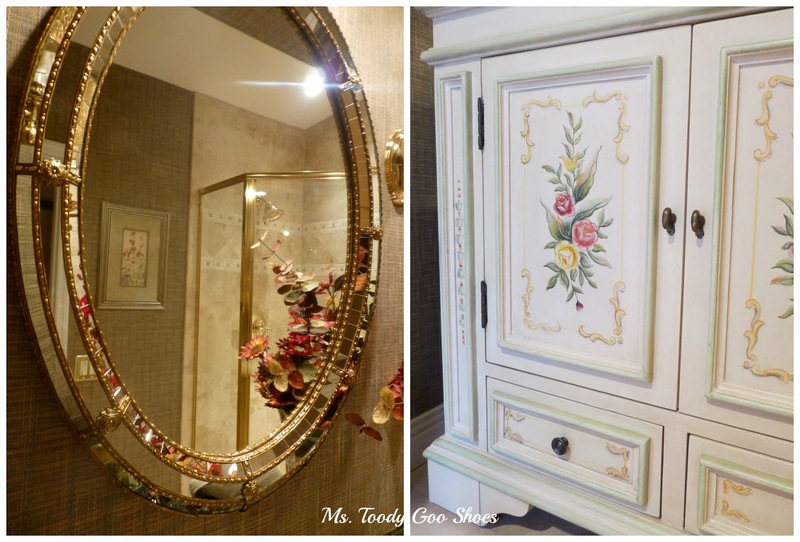 I like her favorite piece of furniture, the toile nightstand and her kitchen cupboard full of dishes. I absolutely love your home. Great job! Dear Debbie, This is a simply blessed and beautiful home. May the memories made be as beautiful. Talk about gracious living! 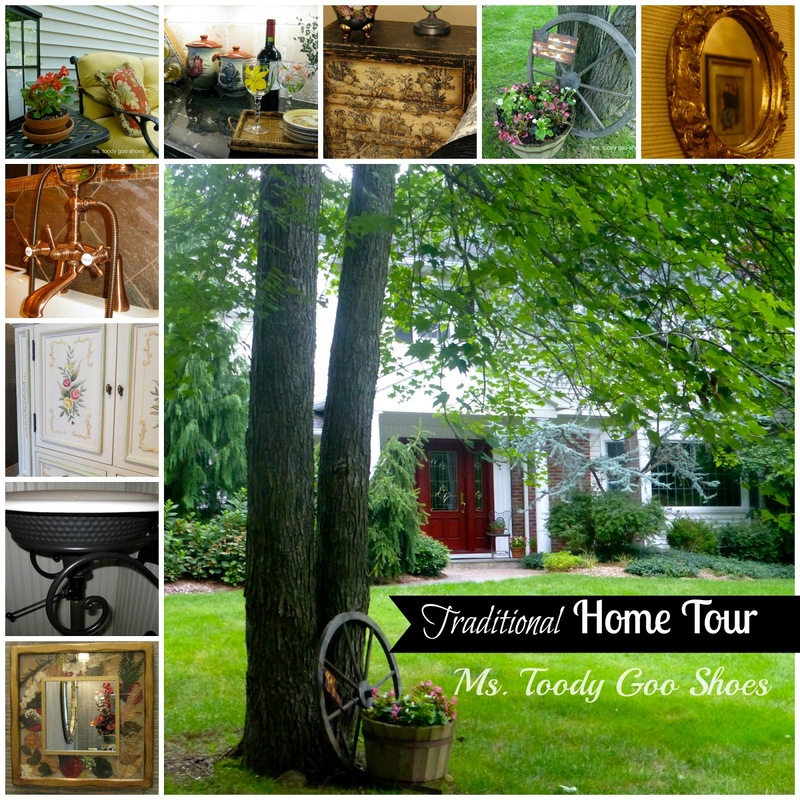 This home tour is really lovely! Oh Amy – it’s just GORGEOUS – love love love!! !